The International French School of Kathmandu (EFIK) follows the French curricula and as such, it is certified by the French Ministry of Education and Culture. The school is registered with the Nepalese Ministry of Education and runs under the authority and protection of the French Embassy. The EFIK is part of the Agency for French Teaching Abroad (AEFE). 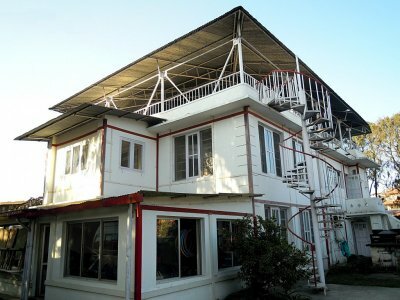 The AEFE and the Parents’ association are bound by an official agreement, the “Convention” Eight families and two teachers created the French school of Katmandu in 1987. First located at Gairidhara, the school was called “Badaboum” after the sound that building blocks make when falling, reminiscent of the way children tumble and always get back up. Originally opened as a kindergarten, the teaching focused on the arts, theatre, yoga, and cooking as well as foreign languages. In 1990 the school opened its first primary classes. The school then moved to its current location in Lazimpat. The International French School of Kathmandu welcomes children from the age of two innursery up to the age of 10 in the CM2 class. The teaching in the school complies with the French curriculum, as established by the Ministry of Education in France. All classes participate in a bilingual educational project which is taught partly in French and partly in English . This project also -reflects the culture of the host country. Our small class sizes allow us to focus on needs of each of our students, creating the foundation of a quality education. Reinforcing a rich educational experience is the diversity of teachers and families that make up the school, and the sense of community thus created.The EFIK (Ecole Francaise Internationale de Katmandou) is a strong element of the French presence in Nepal, and is a point of convergence for children from around the world. With a team of teachers coming from different nationalities, the EFIK’s goal is to help form responsible citizens and promote the acquisition of knowledge included in the curriculum of the French educational system. The school has also set high standards in safety and hygiene. Every three years, a new school project is developed by teachers and the Educational School Council. The objective of this project is to strengthen education in specific subject areas. This project specifies actions to be taken each year, and includes all classes of the school. Currently, the school project focuses on the mastery of French and English. Teaching methods include storytelling, drama and poetry, as well as faux rolex science and art. Physical education activities take place on a regular basis every week and are compulsory. During the school year, two swimming sessions are organized at the American Club. The first session starts in September and ends in October; the second session lasts from May to June. The goal is to make the children feel at ease in the water. The situation is an advantage, but for people residing far, they might want to think twice before as the traffic can be dreadful! Management should be changed and replaced by an experienced principal (with a clear vision on education, willing to expand the school...) The three previous managers where only posted here for financial reasons instead of developing the school to enter in a new era! The French Embassy should stop interfering with decisions. Retrospectively, I should have put my children in Lincoln, British school or KISC. Better management, clear vision, better educational environment. Beware of the PTA in that school which is unfortunately comprised of people who are only and mainly interested in their own benefit! When we were there, we had one horrendous French lady ( related to one staff member at the French Embassy). That lady combined to the pitiful young principal made a sad mixture!